Includes office visit, X-rays if needed, adjustment and 1 therapy. New patients only. Cannot be used with any other offer. WELCOME TO ELM STREET CHIROPRACTIC! For more information or to schedule an appointment with our McHenry chiropractor, call 815-344-1025 today! Located in the heart of McHenry, the leading health professionals at Elm Street Chiropractic are dedicated to helping you achieve your wellness objectives -- combining skill and expertise that spans the entire chiropractic wellness spectrum. Dr. Andrew Harrison is commited to bringing you better health and a better way of life by teaching and practicing the true principles of chiropractic wellness care. 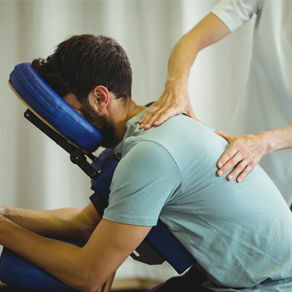 Patients seeking treatment at Elm Street Chiropractic with Dr. Andrew Harrison and Dr. Alana Snyder are assured of receiving only the finest quality care through the use of modern chiropractic equipment and technology. Dr. Andrew Harrison, Dr. Alana Snyder, and the staff have a genuine concern for your well-being! If you are new to our website, please feel free to discover and learn about chiropractic wellness. If you are interested in starting your journey towards wellness please subscribe to our award winning newsletter. If you are already a newsletter subscriber, please explore the member wellness section of our website for wellness articles, resources, and health facts---specifically targeted by Dr. Andrew Harrison and Dr. Alana Snyder to your wellness needs and interests. ELM STREET CHIROPRACTIC PROUDLY WELCOMES TO OUR STAFF…. Dr. Snyder received her first Bachelor of Science in Biology from University of Wisconsin Platteville in 2003. In 2005, she decided to pursue her love for natural medicine by attending National University of Health Sciences. In 2006, she obtained her second Bachelor of Science degree in Human Biology, and then her Doctorate of Chiropractic Degree in 2008. Dr. Snyder uses a holistic approach to patient care, and believes in trying to address her patient’s problems rather than treating only the symptoms. She has a passion not only for chiropractic care, but also for nutritional therapies, life style modifications, and botanical medicines that can aide in the healing process and overall wellness. Dr. Snyder prides herself in educating her patients on their conditions and how they can take an active role in their own healthcare. "Dr Reiser and his staff are great. He is very thorough and explains any problems and the course of treatment. I started feeling much better after only a couple visits." Blue Cross/Blue Shield, Humana, Cigna, PHCS, Coventry, UnitedHealthcare, Assurant, ASH, Cofinity, Aetna, Triad, Compass, Affordable, First Health/CCN, GreatWest Healthcare, Personal Care, Health Spring, Philadelphia American, AARP, Medicare,Allied, Railroad, PBA, Optum Health, Land of Lincoln, Meridian, Pipe Fitters, United Omaha, Gerber Life, Travelers, USSA, Woodman, Farmers, if you don't see your insurance company listed please call our office and see if they have been added.